Combine the granulated sugar, white vinegar, apple cider vinegar, brown sugar, mustard seeds, celery seeds and ground turmeric in a medium saucepan; bring to a simmer over medium heat, stirring until the sugar dissolves. 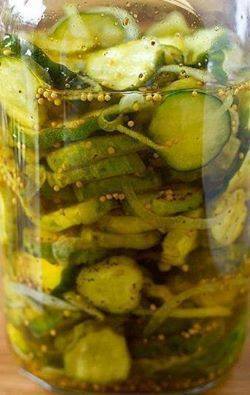 Pour the hot vinegar mixture over cucumber mixture; let stand at room temperature 1 hour. Cover and refrigerate 24 hours. Store in an airtight container in refrigerator up to 2 weeks. Yield: About 4 cups of pickles.